Bryan Electric prides itself on providing a wide range of Canton, Georgia electrical services and repairs. Depending on what our customers need, our professionals are ready to work on everything from interior jobs to exterior upgrades. We strive to bring you the most efficient, affordable solutions possible by using the latest technology to examine your home. 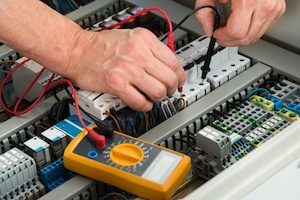 If your electrical system suffers from malfunctions, we’ll work with you according to your preferences to get it working properly again as fast as possible. With our preventative maintenance plans, we can also help you keep the system running smoothly well into the future. Whether you need help with your home’s electrical needs or with powering a large commercial space, we have the tools to assist you. We use cutting-edge equipment to maximize your system’s efficiency, including thermal imaging technology that can keep your electrical components working longer. If you’re running a business, you can’t afford to lose work hours because of electrical issues. This is why we work to find potential problems before they can interfere with your operations. We even help you cut back on your utility costs by providing energy audits, which locate the sources of wasted energy in your home or commercial space. Are you a Canton resident in need of speedy electrical repairs? We offer our customers fast response times, as well as a 24-hour emergency electrical service built around getting you the assistance you need without forcing you to wait around for an excessive amount of time. We also offer helpful, honest transparency in our pricing. At Bryan Electric we tell you what our rates are before we start working, and we also provide you with an accurate timeframe for when our experts will arrive. Your satisfaction is always going to be our highest priority, and our trained technicians will work quickly to get your system back on track without overcharging you. Our certified electricians can get your repairs done when you need them, but our services don’t end there. Let our team of experts analyze your system and figure out where changes and replacements are necessary; this helps you avoid the need for future repairs. Small issues never get the chance to become costly problems with our preventative maintenance plans. We’ll keep your system running at peak capacity. If it’s new equipment you need, we’re more than happy to guide you in choosing whatever best suits your specific needs and budget. For more information regarding electrical services and repairs, get in touch with our team at Bryan Electric today by calling (770) 680-2144. Great service and professionalism from Bryan Electric's electrical services team. We were referred to them by a friend and we were not disappointed. We provide 24/7 Emergency Service!